Daichi Yoshikawa: an interview » edition — a festival for other music. J: I’m not sure how you started. Did you come from playing other types of music? What made you want to play? D: I think I started to play in London. It’s because when I was 18, after high school I was already interested in experimental music, but I never played anything. I had to play piano a little bit — my parents forced me, but I never did anything. I’d just practice 15 minutes before going to the lesson, so it never went anywhere. J: You went to concerts in Japan? J: You knew about Sound323? D: No, A Japanese friend in London told me: “that’s a really good shop, you should check it out” so that’s how I went there and then I asked Mark [Wastell, Sound 323 owner] about Eddie Prévost’s workshop which I’d seen an advert for in The WIRE. About how it is and things and Mark told me to contact Eddie and that’s how I really started to play, I think…. From there. J: You decided to go to the workshop, but were you already playing at home or anything? D: No, no. I don’t remember because I also went to the sound art course at the London College of Communications. J: You’d already started that before you went to the workshop? J: Is that also where you first met Paul? D: No, I think I first met Paul at The Foundry [former bar/concert venue/gallery on Old Street, East/Central London] when Olivier Rodriguez was organising concerts at that time at The Foundry and I think I saw him playing with Mark Fletcher — Paul’s schoolmate from Lancashire. J: Paul was playing electronics? D: Yes, at that time is was already playing electronics, but he was playing really minimalistic, super low volume stuff. It was more like this what he was doing. J: When you went to the workshop what did you bring with you? D: I brought an electric guitar that I’d bought for ichi-man yen [approx 700 kronor] in Machida near my hometown. And I had my fork… and knife… to play on the pickup… but y’know I don’t know how to play and I didn’t like the strings of the guitar, so I wanted to take the strings out as I was just interested in the pick-up and hitting it with the knife and metal things. Anyway, I didn’t like the strings. I just wanted the mic. And then I found out about contact mics on the internet and that’s how I really started to play. J: So you were using the guitar with the contact mic? D: I think in the beginning I had both. I was also in a band called ‘Ampersand’. That was with a friend from the school (LCC) and he had a band with his father and his grandfather and his father’s friend. A family band. They live in Brockley. A noise band. They had a lot of metal objects and a scaffold. So we would have to build the scaffold first for each performance and they hung the metal objects. They had a friend who was a metal sculptor. J: You played a lot of concerts? J: This was at the same time as you were at LCC? D: Yeah, the same time or just after I entered LCC. I think I did that for a few years. J: You were going to the workshop at the same time? J: Who was playing in the workshop then? D: That time was amazing. There was already Guillaume [Viltard, Double Bassist], Ute [Kanngiesser, Cellist], Jamie Coleman [Saxophonist] and Eddie, Ross [Lambert, guitarist], Michael Rodgers was still coming sometimes – Do you know him? A really good guitarist. An American guy. Bechir Saade…. Who else? For me they were the most important people. J: Did you start to play with them outside the workshop? D: Yeah, I think I started to play with Guillaume and Ute. You know we used to live really close to each other in Hackney. I used to live in Dalston — Prince George Road. I think my very first concert I played was in Archway. Matt Milton. You know Matt Milton? He plays violin, very quiet, minimalistic stuff. He was organising one concert for Gianni Gebbia — he’s an Italian saxophonist, an improvisor. That was also a funny thing because he had a group and the double bass player was actually Joel [Grip]. We didn’t know each other at all, but we actually actually met then. And I think Patrick Farmer was also playing drums, well not a drum kit, but drums… and I was playing with Grundik [Kasyansky, electronics], Guillaume and Nicholas — what’s his family name? He works in a French library in West London — and Ute…. Something like this. That was my first concert. J: You play now with a speaker, contact mics and various objects. At what point did you work this out as your instrument or finish a process of working it out? D: It was always about feedback, no? I mean after I chucked out the guitar I felt this is something I can, something I want to do. I want to explore. But for sure, at the beginning I had more of a feeling that I wanted to get more ideas and I was interested in how other people were playing and things. I looked more as well. J: Who were some of the people that you were taking inspiration from or learning from? D: At that time I really liked Toshimaru [Nakamura] or Otomo-san [Otomo Yoshihide]. Who else? I really liked FEN — Hankil and that [Far East Network]. I saw them play the first time at Cafe OTO. That was really nice. J: The Balloon & Needle residency? D: I think so. Yeah. But that was quite a while afterwards but it was a really good concert for me. I really enjoyed it. J: Had you already seen Toshi and Otomo in Japan? D: No, I think just on CDs. Keiji Haino, Merzbow…. Those stuffs. Also Max Neuhaus. The piece with feedback drums. That was a lot of influence…. Also Charlemagne Palestine. He has an electronic piece, no? I forgot. It’s on the CD. The minimal label. What’s the name? J: Table of the Elements? D: Yes. Oh, I’m not sure… but anyway the Charlemagne piece that is just electronics. 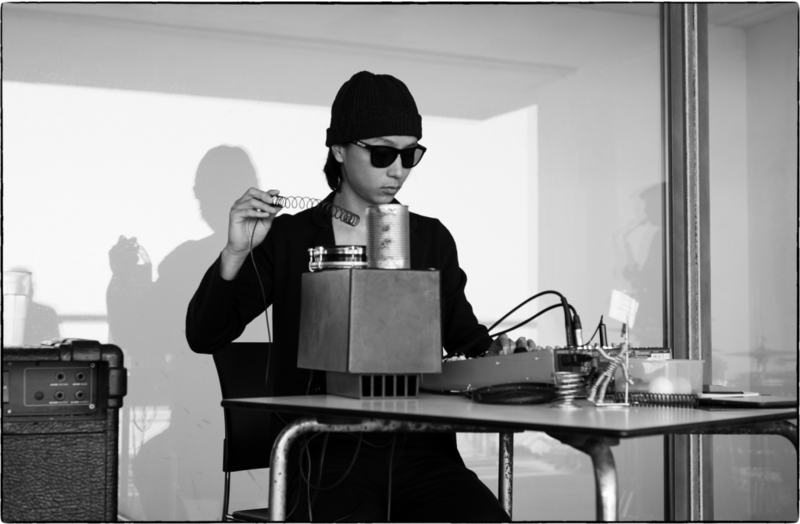 I think I also really liked the Tony Conrad piece with just the oscillators… I really like the pure oscillator stuff. J: You weren’t interested in doing something with synthesisers or oscillators yourself? D: No, No. Firstly, I prefer something very simple [laughs]. I cannot take too much notes. I tried the synth when we played together, when we had that band. I liked it, but I can never remember … I mean I could if I tried to learn. J: but you remember how your own instrument works? It’s like a physical memory? D: Yeah, yeah, yeah… I think I also need the physical interaction. J: What about towards the end of the course at LCC? J: You were not interested? J: So after LCC so you are mostly improvising and playing with other people? J: …and how did you meet Jean-Luc Guionnet? J: because of you ! D: Not only me ! But anyway…. Jean Luc was playing with Eddie [Prévost], a duo. I’m sure there is a recording somewhere. Jean Luc was recording the whole concert. And then you know he comes to London sometimes and he’s good friends with Seymour. So I kept in touch… and then two or three years ago we said ‘OK let’s play’. We played the very first time in Berlin. I organised a concert in a small gallery: me and jean luc and then a another set was Paul and Seymour in duo. In that concert there was only like three audience or maybe four people… and one was Alex [Lau from Empty Gallery]. I’d already seen him earlier in the day at Humpty Dumpty — you know the record shop? D: I just said hello. He had piles of records to buy! And then he showed up at the concert and he comes up and says the duo was really good. I want to make a record with you guys. D: It was two or three years ago. Something like this. So that’s how it started…. They also like san-nin (lll人) and asked us to go to Hong Kong. So I went there with Seymour and Paul and we recorded as well. I think they were interested to do something with the trio, too but the recording didn’t go so well. Last year we played at Cafe OTO in the summer and that went really well. Now we all play electronics as well. Oh, it’s already last summer…. D: It’s more interesting because you don’t get bored [laughs] — it’s easier. But I don’t know if its musically matured or not. But it’s OK. I enjoy it. I hope we can release that recording from OTO.